We get immense happiness in telling you that Andhra Bank has done another publication of Andhra Bank Recruitment 2017 for the post of Staff Nurse to fill up 14 new posts. Aspirants must be an India to apply for this job opportunity and to make a career in Andhra Bank. If you also are willing to give it a try, download the Andhra Bank Sub Staff Notification 2017 before proceeding to apply online. By going through the ‘Eligibility Criteria’, you will have the information on requirements that it takes to apply online for this new recruitment. Therefore, all contenders who are seeking a career in this bank must ascertain if this job opportunity is for them or not. So, let’s get started knowing the requisites. 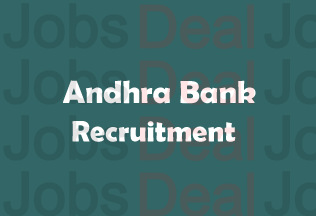 The Bank is also working on another Sub-Staff recruitment which has been made available for the job-seekers, seeking a job in Andhra Bank (AB). Take your time and have a look below to understand the vacancy details and the ‘Eligibility Criteria’ that are compulsory for everyone. Selection Procedure: The aspirants will be selected on the basis of Interview. Pay Scale: You will be receiving the salary of Rs. 9560-18545/- after you are selected for the post. Age Limit: The minimum age limit for applying is 18 years; however, the maximum age limit is 25 years as counted on 1st July 2017. The Age Relaxation of 3 years is for OBC candidates, 5 years for SC/ST and 10 years for PWD candidates. Educational Qualification: Aspirants have to pass the 10th Standard or must possess it equivalent qualification from a respective board. Application Fee: There is no application fee to apply for this recruitment. How to Apply for Andhra Bank Staff Nurse Vacancies? First of all, of you have to download the application form from the main website i.e. www.andhrabank.in. After that, fill up the application form and attest the copies of required certificates in favour of Age, Caste, Qualification, Domicile, etc., and send the duly filled form to the Zonal Office on or before the closing date i.e. 12th May 2017, however, the closing date for Sub Staff posts in Chandigarh is 6th May 2017. So, hurry up!